Make the day memorable. Show your support and help spread the word. New for 2018 — Teams that order 5 or more shirts will have their team name or logo printed on the sleeve of the t-shirt. 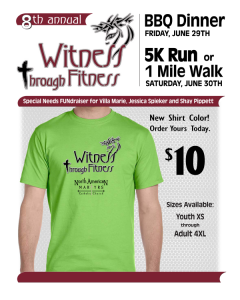 Team shirts must be ordered by Sunday, June 11th. T-Shirts are available for a suggested donation of just $10. Please pre-order your t-shirt so that we can have enough printed.